On March 19th, 2017, the curators and artists of Chance Ecologies gave a special presentation of their work at UnionDocs, the documentary collective in Willamsburg, Brooklyn. This event, titled Chance Ecologies: Artists and Post-Industrial Urban Wilderness, opened with an overview by curators Catherine Grau & Nathan Kensinger, tracing out the evolution of the work that Chance Ecologies has created since 2015, followed by presentations from several of the participating artists of Chance Ecologies. 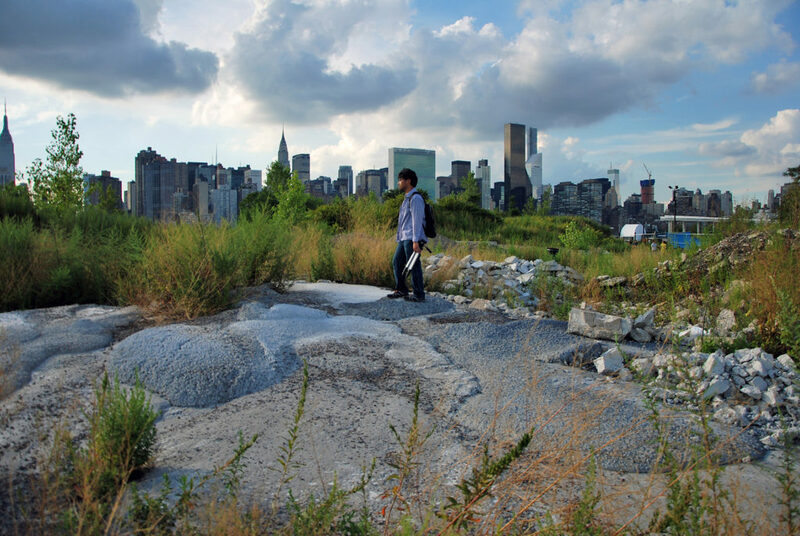 Edrex Fontanilla and Sarah Nelson Wright discussed their project Hidden Vistas, a virtual reality installation that cultivates empathy for places that no longer exist or are too hazardous to visit. Dillon de Give spoke about his Coyote Walks, a walking residency that traces the potential pathways that coyotes are using, as they enter New York City for the first time in their history. And Ellie Irons presented her work with the spontaneous plants that thrive in urban landscapes, which are often derided as weeds, including her projects Feral Landscape Typologies, The Next Epoch Seed Library, The Sanctuary for Weedy Species, and Invasive Pigments. The presentations were followed by a Q&A and discussion with audience members.